One of my more popular recipes is this Christmas sangria that I made when first starting the blog. It’s been such a fan favorite, I even updated it for my cookbook. If you like cranberries or rosemary, you should definitely check it out. 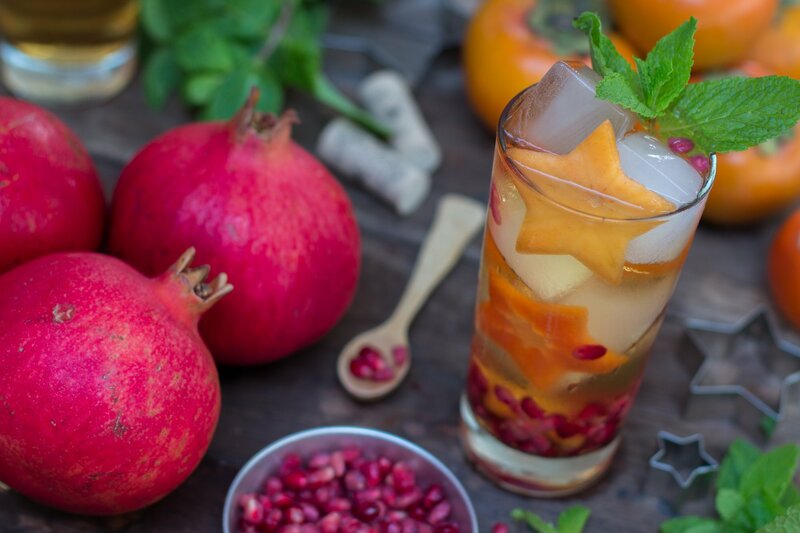 That said, let’s get back to the beautiful cocktail before you, my Persimmon & Pomegranate Thanksgiving Sangria. 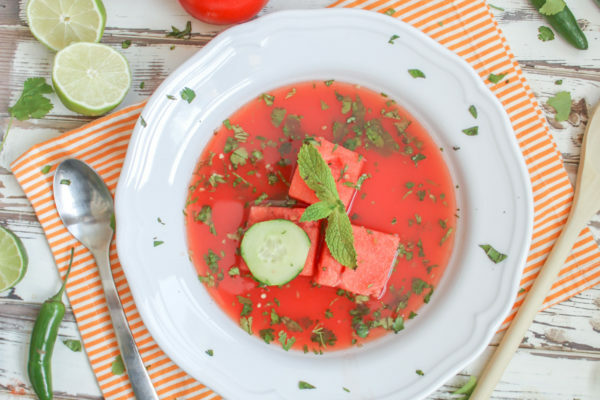 It’s as tasty as it is gorgeous. Let's get started. The 3 persimmons that you use for this recipe should be ripe yet still firm. If they are too ripe, you will not be able to cut them with the cookie cutter. Also, be sure to use fuyu persimmons. While other persimmon varieties can work, hachiya persimmons will not. So just to be safe. NOTE: NOTE: Persimmons come in two major categories: astringent and non-astringent. It's all due to the tannin levels in each variety. 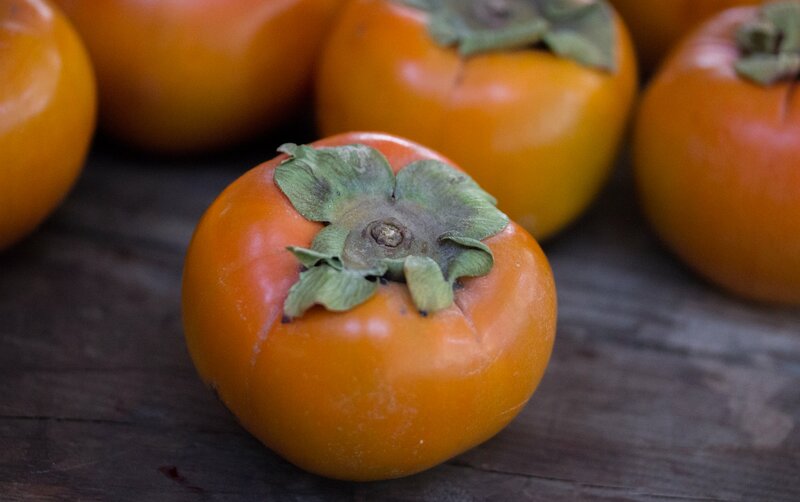 Fuyu persimmons are non-astrigent, meaning they are low on tannins, and can be enjoyed before they are fully ripe. You can eat them like an apple. Hachiya persimmons are astringent. So, they need to be over ripe or eating them is a very unpleasant experience. When ripe, hachiya persimmons are very soft, and sorta feel like a water balloon. That's why they won't work here. It would be like using a cookie cutter on jam. In fact, persimmons have such high tannin levels, they are used to brew sake. So be sure to thank a persimmon the next time you are throwing back a sake bomb. Trim both ends of the persimmons and then slice them width-wise, into 1/4-inch thick slices. Take a star cookie cutter to each slice, saving the left over. You won't need it for this recipe but here is one damn tasty smoothie you can make with them. Place the cutouts on a parchment lined baking sheet and them place them in the freezer. 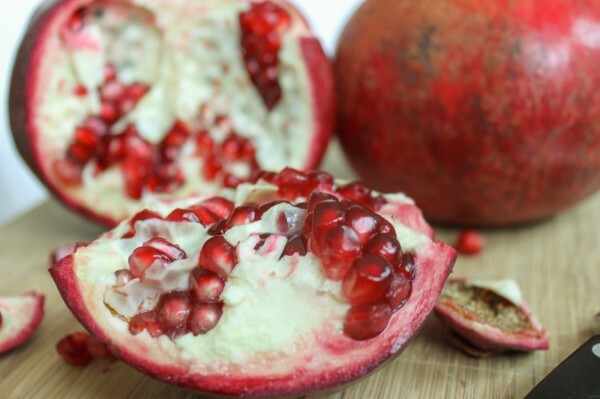 Now let's prep 1 pomegranate. Just check out my How To video on the quick and easy way to seed one. Store the arils in the fridge in an airtight container. I've said it before and I will say it again: good sangria is made with good wine. 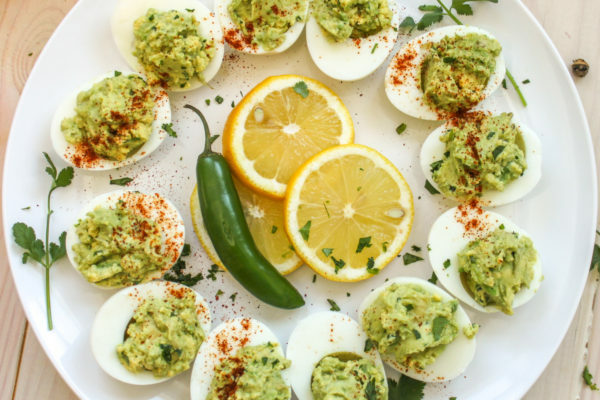 It's a fact--good ingredients make good food. The biodynamically grown basil that I get from my farmers market makes one hell of a margherita pizza; I don't have to eat the basil raw and on its own to appreciate it, ya know? So, start out with a decent bottle of Pinot Grigio... something under $20. Preferably one that is off-dry with good fruit flavor. No two buck chuck! 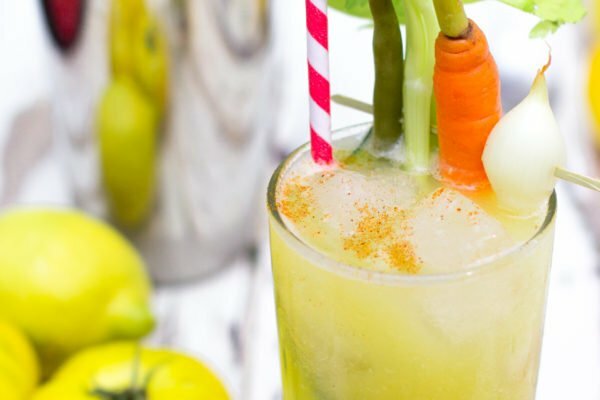 Add a bottle of Pinot Grigio, 1 1/2 cups white grape juice, 1 cup spiced rum, and 1/4 cup sugar to a medium pitcher and stir, until the sugar is fully dissolved. Let chill in the refrigerator. NOTE: FACT: The name Pinot Grigio is a bit misleading as people often assume this varietal originated in Italy, but it didn't. It is traditionally a French grape from the Burgundy region where it is called Pinot Gris. In fact, it and Pinot Blanc are just genetic mutations of Pinot Noir. But it wasn't until it reached Italy that it really found success. And today it is the second most popular white wine in America. The first American Pinot Gris vines were planted in Oregon in 1966 by David Lett from Eyrie Vineyards. 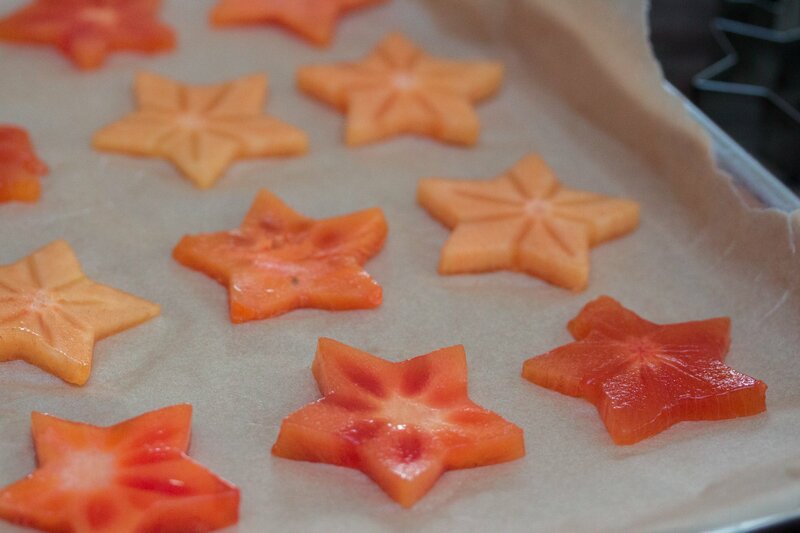 After about an hour, the persimmon stars and the sangria should be ready. 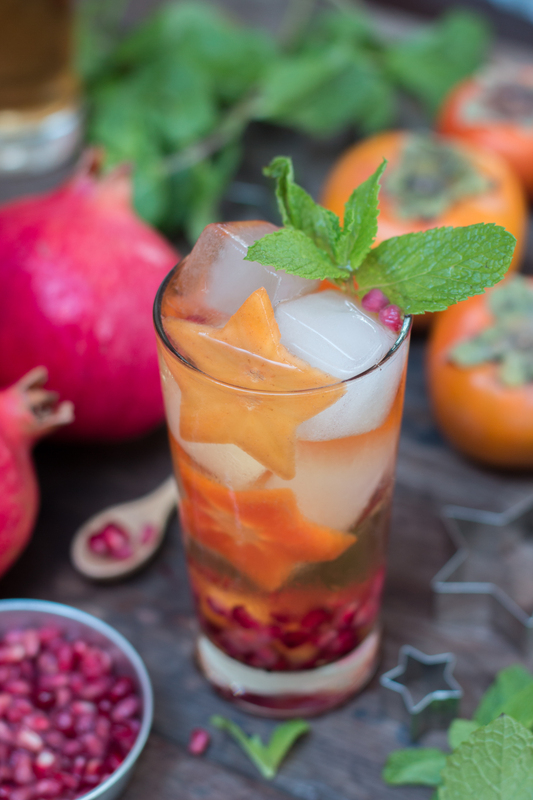 Add 2 cups of ice to the pitcher along with the pomegranate arils and the frozen stars. Serve the sangria over ice.Enjoy!